The 4CYTE Canine granules support your dog's joint functions. It contributes to the maintenance of healthy cartilage and joints. For alternatives, please look here. 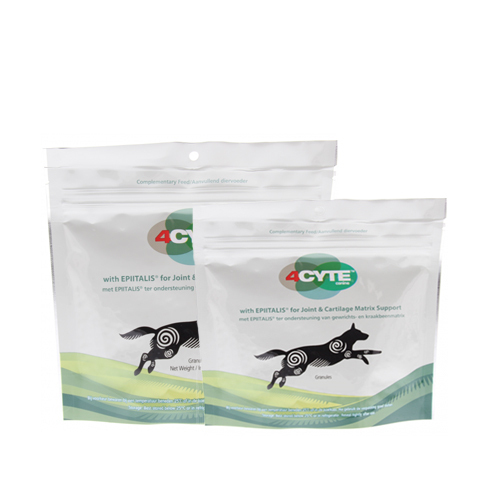 4CYTE Canine is a food supplement containing Epitalis that contributes to your dog's freedom of movement. The active substances in the dry food support the flexibility and mobility of the joints. In addition, they help to restrict joint inflammation and the breakdown of cartilage. The supplement can be effective in working dogs, old dogs, dogs with an existing arthritis conditions or dogs that have had or are due to have joint surgery. Please note: Before using this product in pregnant dogs and to treat lameness, please always consult your veterinarian. 4CYTE Canine can be given with food. There is a scoop in every packaging. One scoop contains approximately 0.4 grams. To get your dog used to the product, we recommend giving him half a scoop for the first three days. Administer the initial dose for 4 to 6 weeks before moving to the maintenance dose. 4CYTE Canine is available in 50 gram and 100 gram packs. Epitalis, Abalone, New Zealand green-lipped mussel and fish cartilage. Have you used 4CYTE Canine before? Let us know what you think about this product. I've had my dog on this for three weeks now following the recommended administration process. My little girl was showing first signs of lameness from two luxating patellas, double hip issue and a sacrum spur. I rushed her in to the vet and he was reluctant to operate yet and offered 4cyte canine on top of her current daily maloxicam and monthly injections. Within a week she was resting up on her hind legs hopeful of getting food snacks. ???? She is jumping up on the bed and couch again (impossible to stop her if unless she is feeling pain she's so energetic naturally). My vet told me he uses it on his dog too...guessing that's the best recommendation. Give it a go it seems to be a magical product fairly new to the market. Just coming to the end of our first month on 4cyte for our elderly Bearded Collie. He's bouncing again, swift and agile, and runs for most of his walks, giving the younger Beardie a run for his money. He's jumping in and out of the car, and scratching himself from a standing position - when he has had to sit down to scratch for the last 2 years. Fantastic product - wish we'd found it sooner.